Those who know me say that having a vegetable garden is just in my blood. And I’m likely to agree with them. I guess it’s just something deep inside me that feels the strong drive to nurture the earth and through grit and gentle determination coax from it nourishment for both my body and my soul. Then Love happened. A group of truly selfless people surprised me early Saturday morning by gathering together and showing up at my house, work gloves and garden tools in hand. Yep, I cried. Although I was helpless to be of any assistance I was given a chair to sit in the garden as these wonderful friends donned gloves and hand tools, garden hats and seedlings. They fought the ever-present fire ants, yanked and dug out massive amounts of spring weeds, raked mulch and dirt and at last set the tender seedlings into the beautifully aromatic soil now ready to receive them. Now let me tell you that’s a bunch of love to give up a precious Saturday morning – one of the few days away from their daily grind, to come dig WEEDS out of an overgrown veggie bed for a garden that’s not even theirs! I’m overwhelmed with gratitude for my Garden Angels! Looks like I will indeed have a veggie garden this year. And this will be the most special garden I’ve ever tended in my entire life, because it’s the garden that love planted. Happy gardening! Why Can’t We All Get Along With Our Fellow Humans?? Gossip: Words Really CAN Hurt! 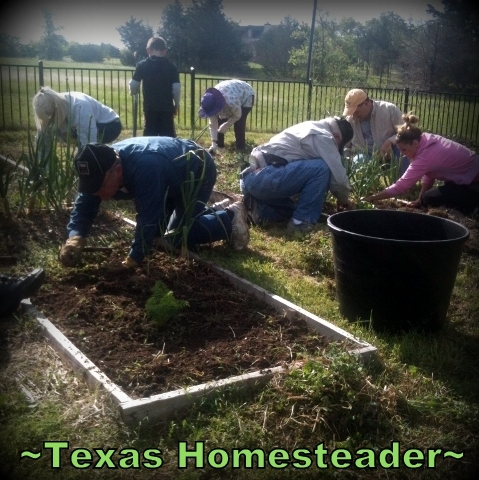 This entry was posted in Blog Posts and tagged Gardening, Inspirational, Spring on April 21, 2013 by Texas Homesteader. What a wonderful gift! It is so wonderful that you have such great supportive people in your life! Thanks so much for sharing on Natural Living Monday. Aww. How sweet! I’m so happy for you that you will have your garden this year after all. You’ve been in my thoughts and prayers. What wonderful friends. It makes the heart feel good to know there are still people like that out there. Enjoy your garden. Random acts of kindness are always the best! This heartfelt story made me smile. Thank you for sharing! This story brought tears to MY eyes! What a great example of God’s love at work. Thanks for sharing. I will be looking for ways to bless those in my community. Fantastic!!! This is a wonderful post about selflessness and community. It’s SO important to focus on the good. Thank you for sharing at Tuesdays with a Twist! Although this post tell a lovely story about your community, it tells me about the person you are too. A group of people doesn’t turn up to do this kind of thing without a good reason or to repay something. I reckon you’re a valued worker in your community and these people have acknowledged that by the working beee in your garden. How fabulous! Happy gardening. What a wonderful story. You really are blessed! I know it will be one of your best gardens ever!